In today’s Gospel, Our Lord tells us to wake from sleep and to watch. We have too take time to consider what meaning our life has here and now. As we were reminded last week on the feast of Christ the King, Jesus gives true meaning to each of our lives. The Incarnation, God made man, effected a radical change to the universe. Jesus taught us what it means to be human -- to be in the image and likeness of God. If we do not see this clearly, it is time to remove whatever interferes with our vision. 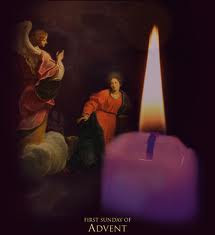 The Church gives us this Season of Advent to make a thorough and honest examination of conscience and to purify our souls through Confession so that each of us can welcome and receive our Savior. This is the time to see those things, attitudes and dispositions that separate us from Him. We have to look deep down inside ourselves to confront the root causes of being lukewarm or cool in our relationship with Him. Through Confession, prayer and penance, we are released from the hold of these bad influences and traps. Just as we look for the causes of bodily sickness or a general malaise, we examine our hearts and souls to learn why we are not as close to Jesus as we should be. Carefully going over the Ten Commandments is necessary. Also, it is beneficial to consider the influence of the seven capital sins: pride, covetousness, envy, sloth, lust, avarice and gluttony. How many of these are within our actions, our thoughts, our words and the way we look at persons and things. It is not easy to do this because we are leaving ourselves open to a realistic evaluation of ourselves. We have to let go of that often false, perfect self image. Most of us would like to see ourselves as selfless, noble and good. We, however, have to see the selfish and bad things lurking inside. This is the only way to spiritual healing. Then, we bring these to Confession, and we are cleansed by Christ. His strength and love take the place of the corruption of sin. When Christmas arrives, new born King should find us with everything in order and with each of our souls ready to receive Him.